Kid entrepreneur Max designed these mugs to make mealtime so much more fun. "The world would be better if we could play with our food!" That's the maxim of Max, the kid entrepreneur and sports fan who created these mugs to make mealtime so much more fun. His first was the Mug With a Hoop™, which he made in art class at age eight. 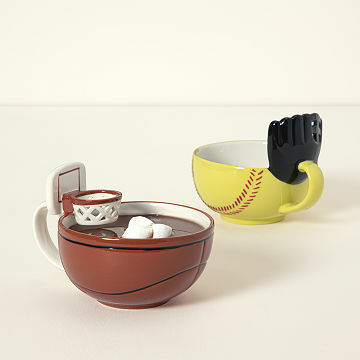 Now, kids can slam dunk, score goals, and throw strikes using anything from breakfast cereal to soup crackers. Made in Thailand. Visit our blog to learn more about Max and his designs. Whiz kid Max is a young entrepreneur with a head full of ideas. With a vision that the world would be better if we could play with our food, his playfully creative spirit comes through in his interactive designs. At just eight, he created his first patent-pending piece—a sporty mug he came up with in art class. He was named one of the ten finalists for the Product Pitch at Fenway contest, an honor which led to him throwing out a pitch at Fenway Park! Max's ventures also raise awareness and support for dyslexia, a cause close to his heart. He attends a special school dedicated to students with the learning disorder, and although it makes reading and writing challenging, Max and his family emphasize that those with dyslexia see and interpret the world differently. This silver lining is evident in the self-starting wunderkind's knack for product design. Slam dunk for basketball lovers! This bowl is both fun and functional. It's big enough for a good portion of cereal or soup or pasta and is solidly built. Hot cocoa with marshmallows, cereal, soup, etc. Hasn't told me of use yet. The gift that is fun all year round! Great Gift for a Kid who loves sports. Also who loves to eat. The gift you can actually play with your food and not get in trouble for. Bright colors, sturdy design. Pleasantly heavy. Used it for hot chocolate- handful of mini marshmallows, Soup- mini crackers, oatmeal- raisins and nuts....of course cheerios in milk! My son uses this to put snacks (like goldfish or chips). He also uses it as a toy to pretend that his little toy figurines are playing a game of basketball. Keep coming up with Cool ðŸ˜Ž Products!